Mike Meru thought he was making a good investment when he borrowed $600,000 to train as an orthodontist. But at age 37, he now owes $1 million — and despite making regular payments, he owes more every single month. In 25 years, his debt will total $2 million. 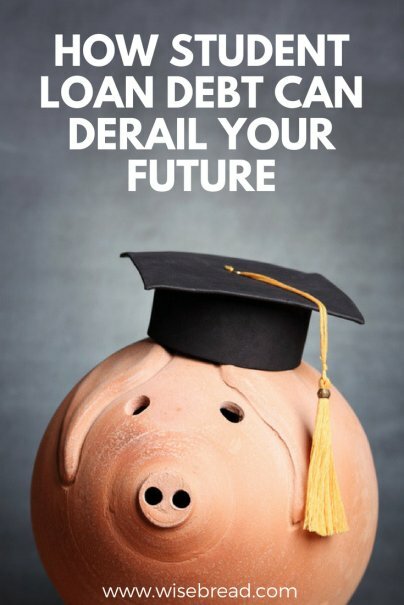 While seven-figure student debts are still not something you see every day (in a story about Meru, The Wall Street Journal reported that about 100 people are in this boat nationwide), hefty loans are more and more common. Five percent of student loan borrowers now owe more than $100,000, and 170,000 students nationwide owe more than a quarter million in federal loans alone, according to The Brookings Institution. Student loan consultant Travis Hornsby, whose average client owes $280,000, says he has worked with several grads with debts around the million-dollar mark — almost exclusively specialist doctors and dentists. "They make a lot of money, but not enough to cover that level of debt service," Hornsby wrote in an article for Business Insider. After getting her bachelor's degree and spending a year teaching English abroad, Amber Williamson was applying to graduate schools. At 24, she hadn't yet decided on a career, but she knew her $60,000 in student loan debt limited her choices to only fields that could offer adequate income to make the payments. "I'm doing everything right, but still being penalized for something I've been told to do," she told MarketWatch. Natalie Bacon and Liz Stapleton don't know each other, but they have one big thing in common: They borrowed buckets of money to get law degrees, only to find out that they hated practicing law. After graduation, Bacon was shocked to realize that interest accruing while she was in school had already ballooned her debt to $200,000. "I was really irritated and frustrated with the amount of debt I had. I felt like someone should've told me what it really meant, or I should've had a class on it, or something," she wrote on her blog. Stapleton found herself in a similar boat. According to her blog, Less Debt More Wine, Stapleton currently owes $258,000. Both women took the bold step of quitting their law careers, managing, perhaps ironically, to build careers instead in financial advising and writing about managing their debt. But many other lawyers and doctors remain trapped by their debt in careers that they hate. During her undergraduate and graduate studies, Becca of Surviving Student Loans knew she was going to have at least $90,000 in debt — but she didn't think through how the constantly accruing interest would affect that total. For the first three years after graduate school, she made her minimum payments every month. Now, she owes $124,000; about a quarter of that is interest. "In my head, the debt I took out was going to be my total debt. Boy was I wrong," she wrote on her blog. Federal Reserve researchers noticed that as homeownership in the United States declined during the financial crisis, young people were especially impacted. "... Increases in student loan debt might be a key factor pushing homeownership rates down in recent years through effects on borrowers' ability to qualify for a mortgage and their desire to take on more debt. Corroborating this claim, recent surveys have found that many young individuals view student loan debt as a major impediment to home buying," the researchers wrote. They crunched the numbers and found that there is something to this: Every 10 percent increase in student loan debt is correlated with a 1 to 2 percentage point drop in homeownership in the first five years after school. A joint study by American Student Assistance and the National Association of Realtors found that 83 percent of millennials who don't own homes blame student debt for their inability to buy. These millennials expected their debt to delay their first home purchase by an average of seven years. One in five former students puts off marriage due to student loan debt, and nearly one in three postpones starting a family for that reason, American Student Assistance reports. Another American Student Assistance survey found that 62 percent of respondents put off saving for retirement due to student loan debt. Worse, the same report says that the number of people over age 65 who have student debt — some for their children's education, but mostly for their own — increased by a whopping 977 percent between 2005 and 2015.